At the heart of it all. The new 235 Water Street is at the heart of downtown, at the very centre of the oldest street, in the oldest city in North America. 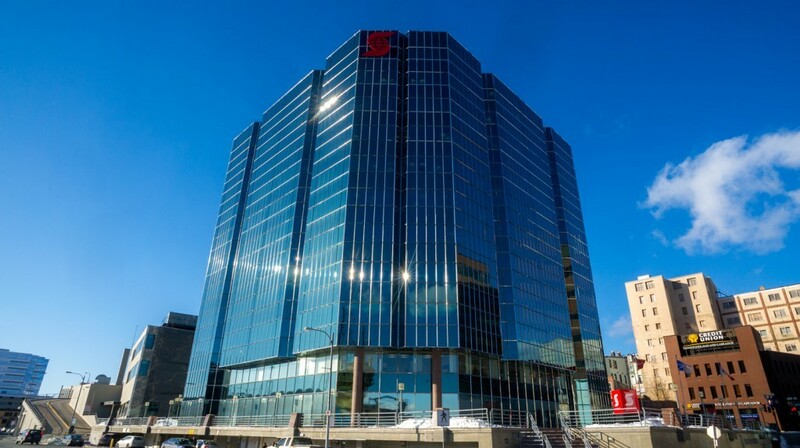 This 11-storey iconic glass tower, facing out into the Narrows, has been part of St. John’s history for nearly 30 years, since 1987. The transformation has moved this Class A building forward a whole generation with the best of today’s newest technologies, including greater efficiency and greater comfort for all those who visit and work there. It has also reintroduced pedestrian access by opening up Ayre’s Lane, connecting Water Street to the harbourfront. The new building continues to support the longstanding heritage of Water Street architecture and is a demonstration of East Port Properties commitment to downtown St. John’s. Loading. If problems persist, view this listing on altusgroup.com. At East Port Properties, we take great pride in our ongoing commitment to environmental responsibility. Create your own custom property brochure. Do you have questions about anything you’ve seen here? Luckily, we have answers. Please fill out the form below.